In our Exploring Artism session last April, we talked about what we like to do when the weather gets warm and the sun is out. See our prompt worksheet here. This felt especially great after such a long winter. 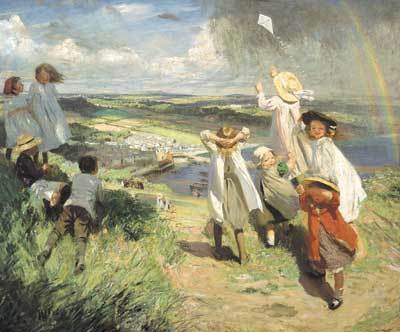 After talking about all of the things that kids like to do outside today (running, swimming, going to the park), we went into the galleries and back in time one hundred years to Dame Laura Knight’s Flying a Kite painting from 1910. See the image here. Looking at the work as a group, we discussed what the children were doing in the painting, what the weather looked like, where the children in the painting were at, and what kind of noises one might hear at such a place. With each response, the participants were asked to justify their answer from visual clues in the painting (Ex. the weather looks windy because the clothing on the children appears to be in motion). Focusing on the action of flying a kite, we discussed the different elements that would be needed to fly a kite (wind, running, nice weather, string, etc.) Everyone especially enjoyed getting to create their best “wind” sound and getting to have a fan blow their hair. This helped everyone to better understand the actions occurring in the painting while also creating a multisensory experience in the museum. Look at more wind poems here. After viewing the painting in the gallery, everyone had the opportunity to create their own kites. We used prepackaged kits to make our kites, but there is a website here on how to easily make your own kite at home. Everyone was able to decorate their kites with ribbon for the tails and markers and oil pastels for the diamond. Finally, we had the option of presenting our masterpieces to the rest of the class. Join us for the next Exploring Artism program this Saturday, September 21 from 10:30 to noon. The program is free, but advance registration is required. Please email the YCBA Education Department or call 203-432-2858 with your contact information. A museum educator will contact you by phone to complete your registration.